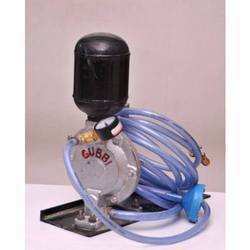 Providing you the best range of grout pump and hand grouting pump with effective & timely delivery. high pressure grout pump is designed for use in medium and large sized pre stressed concrete works. It is a hand-operated diaphragm unit and weighs only 9 kg. It is easily handled and particularly suited for working on scaffolding or where operating space is restricted. The pump produces a pressure of 10 kg/cm2 (140 psi) and delivers 400 liters of neat cement grout per hour of pumping. The pump is so designed that all working parts are readily accessible for easy maintenance. · Design in conformity with International standards.